St. Nicholas is the Romanian and Eastern European Christmas Figure that is Celebrated on St. Nicholas Day on Jan. 6th. At Dallas Vintage Shop, we take our St. Nicholas Traditional Costume and Santa Clause Costumes serious. This Fancy Romanian ‘Santa Clause’ Costume is just one of many Elaborate Christmas Holiday Character Costume Choices we have. There are other International Tradition Santa Costumes besides this St. Nicholas Costume and there are other St. Nicholas Style Costumes besides this version of St. Nickolas. 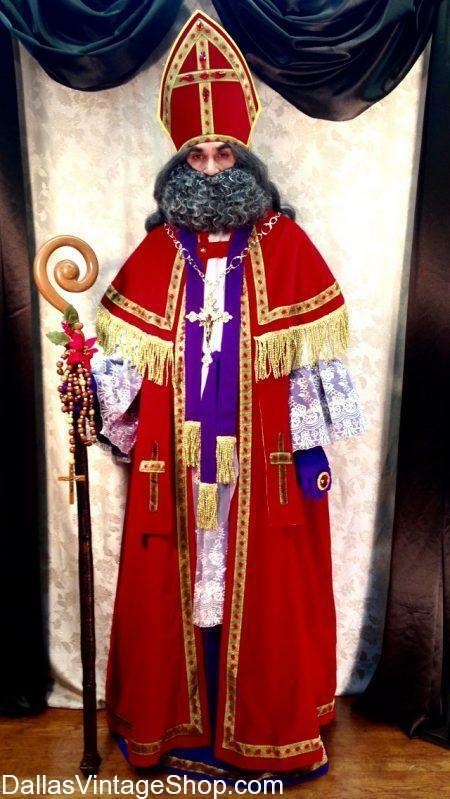 If you need Elaborate Santa Costumes that have the Liturgical Detailed of this St. Nicholas ‘Santa’ Costume then we are your Santa Clause Costume and Christmas Holiday Costume Headquarters. You’ll also find the British Father Christmas Costume & Costume Accessories like this Mitre, Staff, Lavish Robes, Quality Wigs & Beards and more than you ever imagined. Everything you see here in this Detailed St. Nicholas Outfit is only a small sample of the kind of Santa and Christmas Iconic Characters you can expect to see in our shop. This St. Nicholas Traditional Costume is just one of many Christmas Character Costumes and Santa Clause Costumes we have in stock. You are in Romanian category.